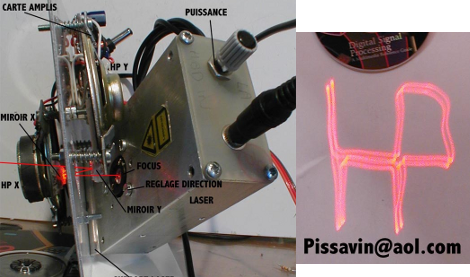 [Hubert] sent in his experiments using HDDs, CDROMs, speakers, and other components to make an XY laser plotter. Those carefully reading will note, its not all three to make one plotter, but rather three plotters each using a separate system. The setups have their advantages and disadvantages, and [Hubert] is sure to point them out; including circuit diagrams and pictures to help you on your own trials. There is a little difficulty in reading English not so good, but considering we’ve never seen a single-laser vector plotter done before (spirographs come close, and no one wants to wait 85 seconds) it’s still very impressive. Those weren’t my experiments (but, I did send in the link), I don’t want to be seen taking credit for other people’s work. Hold mouse over the email in the picture. I see what you did thar. The LPT port seems a bit slow for this, I’d think that using a sound card output would give more speed and probably precision, particularly driving the speakers. I’ve found that the parallel ports on most PC’s (when you can find a PC with one) tend to be rather slow. Especially if you are using something like interpreted BASIC to drive the port. The best I could do with BASIC (many years ago) was something like 500 updates / second. Using C and the standard libraries may also impose a speed limit. Even so, you noticed that the hardware response was greatly affected by the signal frequency – this suggests that some sort of pre-emphasis 9equalization) may be helpfull. yeah sound card is the way to go i think. there is even softare for generating waveforms from vector images. Looks like it’s laser week on HaD. Definitely a nifty setup though. hi, i am not the hubert from that site.